Solar embossed plastic mulch film warms the soil more effectively than black plastic mulch films or green plastic mulch films, producing a more favourable soil environment for crops sensitive to cool soil temperatures. The soil heating properties of Solar are maximized during sunny weather. Weed suppression under Solar embossed plastic mulch film is the result of the duel inhibitory effects of low light intensity and high temperatures on weed growth and survival. 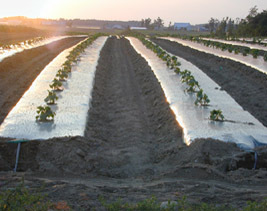 Solar embossed plastic mulch film is recommended for crops such as cantaloupe, melon, watermelon, pepper, eggplant, cucumber, strawberry, zucchini, etc., and for weed suppression.